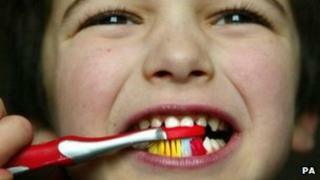 A scheme to encourage nursery children to brush their teeth has saved more than £6m in dental costs, according to a new study. Public Health Minister Michael Matheson said: "This is an amazing achievement and shows just how much can be saved from a very simple health intervention. "This has seen less tooth decay in children which means less toothache, fewer sleepless nights and less time off school. "By this simple measure, NHS costs associated with the dental disease of five-year-old children have decreased dramatically. "More children can just be treated routinely in the dental chair because they need less invasive treatments, so fewer fillings and fewer extractions, and many more children with much better oral health than we have seen in many years."